Blowfish encryption is implemented a keyed, symmetric cryptographic block ciphering algorithm designed by amazing talent Bruce Schneier in 1993 and placed in the public domain. Today, blowfish is included in a large number of cipher suites and encryption products. Blowfish’s security has been extensively tested and proven. The best encryption software is based on blowfish cipher. Let’s consider the reasons. As an accessible to public cipher, Blowfish has been subject to a significant amount of cryptanalysis, and full Blowfish encryption has never been broken. Blowfish is also one of the fastest block ciphers in public use, which functions on a wide variety of processors found in mobile phones as well as in notebook and desktop computers. The last fact makes it ideal ciphering tool for a products like Handy Backup. Need 100% guarantee to be protected from unauthorized access and restoration? 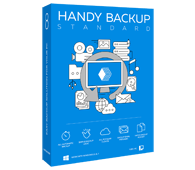 Try Standard edition of Handy Backup. Schneier designed Blowfish as a general-purpose algorithm, intended as a replacement for the aging DES and free of the problems associated with other algorithms. Notable features of the design include key-dependent S-boxes and a highly complex key schedule. Blowfish is one of the fastest block ciphers in widespread use, except when changing keys. Each new key requires pre-processing equivalent to encrypting about 4 kilobytes of text, which is rather slow. This prevents its use in some kind of applications, but is not a problem in Handy Backup. Mostly all versions of Handy Backup maintain ciphering with Blowfish. It’s too simple to use it: you just have to enter the password, and it will be used as a key to all your files and folders encryption in a certain backup session. Just don’t forget the password – decryption may take the centuries. Geek alert: check out official site of Bruce Schneier, who made the Blowfish code.